If you happen to be a stay at home dad or stay at home mom, if you work 50 + hours a week the one thing most all of us can agree on is we need more money. To often when people start thinking about getting involved with a business they are focused on finding products they can represent. For lot’s of people around the world network marketing type businesses are a way for people to supplement their incomes. The problem is many of these people aren’t making money. In fact most people are failing.. They are failing because they aren’t really clear on what their intention is. They are to busy talking about their products which nobody cares about. If people were to be really honest with themselves they are doing whatever it is they are doing because they want money. If there wasn’t a compensation plan to most of these “products” people wouldn’t be so enthused about pushing the products. If someone said to you -> Just do this and do this and do that and you will make $10,000 a month part – time would that interest you? That is the type of thing that can happen when you get educated. Am I making that much money myself in my part – time business? Not yet… But I am very very close because I have been applying what I have been learning in my internet business. 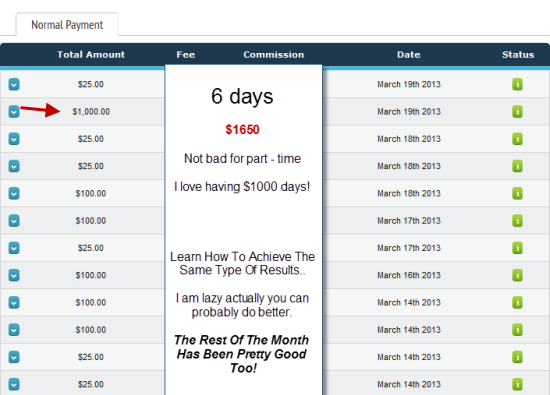 I found the holy grail that everyone online who wants to make money is looking for. I know I was shocked at first, especially when the money finally came pouring in. Here is some proof of whats going on in my business..
Due To legal concerns I need to tell you that results can and do vary. Just because I have made money doesn’t mean you will make money. While I believe 100% in what I do and I believe 100% that you can also achieve great results. I still don’t know you well enough to know how you will do. Also to be totally transparent here is a Income Disclaimer. If You are a Stay at Home Mom, Do You Feel Guilty About Spending Money on Yourself? Next Next post: What Are You Expecting In Your Life?